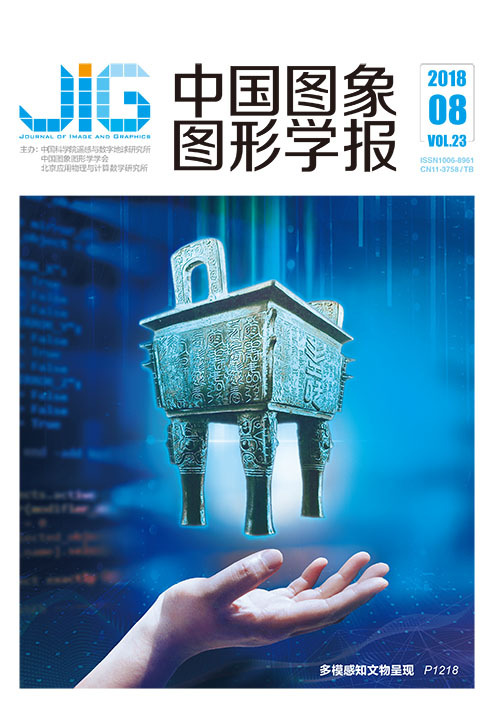 路利军, 男, 副教授, 博士, 主要研究方向为图像重建。E-mail:lulijun@smu.edu.cn. Objective Shape representation and shape matching are the basic tasks in computer vision and pattern recognition. Among all the region-based methods, several classic methods are already available, including Hu moment invariants (Hu method), angular radial transform (ART method), generic Fourier descriptor (GFD method), histogram of Radon transform (HRT method), and multi-scale integral invariant (MSⅡ method). Given the long time spans between all these proposed methods and the fact that only one factor (i.e., retrieval accuracy) is always compared in the past studies, we need a comprehensive comparative study of all these methods to help in application engineering and in future studies. Method To compare the different aspects of the five shape descriptors, we utilize three shape databases. The first shape database, which is a group of simple geometry and one that we modified, includes ten seed shapes. From each of these ten seed shapes, we construct three more shapes through non-rigid deformation, with increasing deformation from the first one to the third one, that is, 40 basic shapes constructed in total. Finally, for each of these 40 basic shapes, we obtain another three more similar shapes by random scale, random rotation, and random translation. Consequently, 160 shapes in the first shape database are constructed. In the retrieval test of the first database, we define a new rule of test scoring, which not only count the retrieval score but also considered the retrieval result order. Therefore, this new test score rule can inspect the intrinsic representation and retrieval ability of the shape descriptor. The second shape database we used in our comparative experiments is the MPEG-7, which consists of 70 different shape categories with each category consisting of 20 shapes of the same category modulo with various rigid and non-rigid deformations and is the standard shape database for shape descriptor and shape retrieval. The experiments are performed on 1400 shape images. Test score for MPEG-7 shape database is based on bullseye score, which counts the number of shapes in the same category (20 shapes in this case) within 40 best matching shapes. The third shape database we used in our experiments is the collection of vehicle trademark shapes. We collect 100 common vehicle flags, such as from Bents, BMW, and Toyota. For each of these 100 vehicle flag shapes, we construct three additional shapes by random scale, random rotation, and random translation and another three shapes using the random perspective parameters. Thus, we obtain a total of 700 vehicle flag shapes. The test score we used for this third database is also based on bullseye score, which counts the number of shapes in the same category (seven shapes in this case) within 14 best matching shapes. In all retrieval experiments for all the three shape databases, we not only compute the test scores but also the retrieval stability using the standard deviations of retrieval scores. We analyze and verified the computation complexity of the compared shape descriptors. After obtaining the test scores, retrieval stability, and computation complexity, a weighted formula, which considers all the three factors, is also defined to measure their comprehensive performances. Result In the retrieval experiments of the first simple geometry shape database, the HRT method achieves the best test score and lowest standard deviation, with the GFD method following, which indicates that HRT is not sensitive to noise in comparison with the other methods. 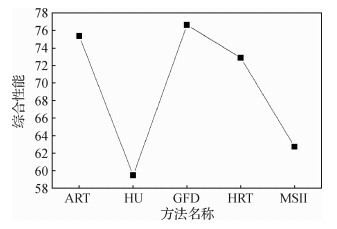 In the retrieval experiments of the second shape database, ART and GFD methods obtain almost the same retrieval scores. In the retrieval experiments of the third shape database, GFD, ART, and HRT methods almost achieve the same retrieval score. In all of the retrieval experiments, the five compared methods are all invariant to scale, rotation, and translation, which are the fundamental requirements for a shape descriptor. We analyze and verify the computation complexity of the 5 methods and find that in the stage of feature creation, Hu method has the lowest computation complexity, and in the stage of feature matching, except for HRT method, all the other four methods have low matching computation complexity. The comprehensive performances of these five methods are measured by a weighted formula, and the GFD method has the best performance with ART as the next. 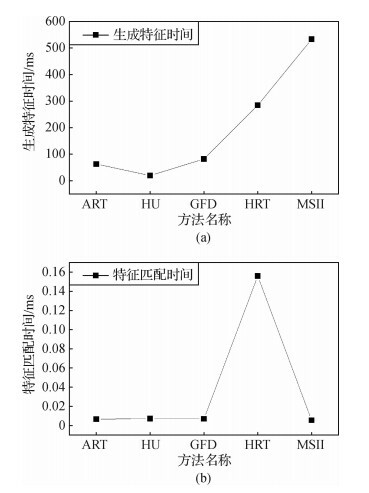 HRT method can degrade with large number of shapes, because HRT method has higher complexity in matching phase than the other methods. The performances of Hu and MSⅡ methods are not satisfactory in all our experiments. The visual features of a shape can also be captured practically by the method of projecting shape onto a basis of orthogonal base functions. In this study, we suppose that the visual features of an image can also be captured practically by the same projection method. Conclusion Among all the evaluated region-based methods, GFD and ART methods have the best performance, and we suppose that they can be employed in engineering applications. Finding new basis of orthogonal base functions may be a fruitful research direction in shape visual feature extraction, as well as in image visual feature extraction, because projecting a shape onto the orthogonal base functions can capture its intrinsic vision features. Zhang D S, Lu G J. A comparative study of Fourier descriptors for shape representation and retrieval[C]//Proceedings of the 5th Asian Conference on Computer Vision. Melbourne, Australia: ACCV, 2002: 646-651.